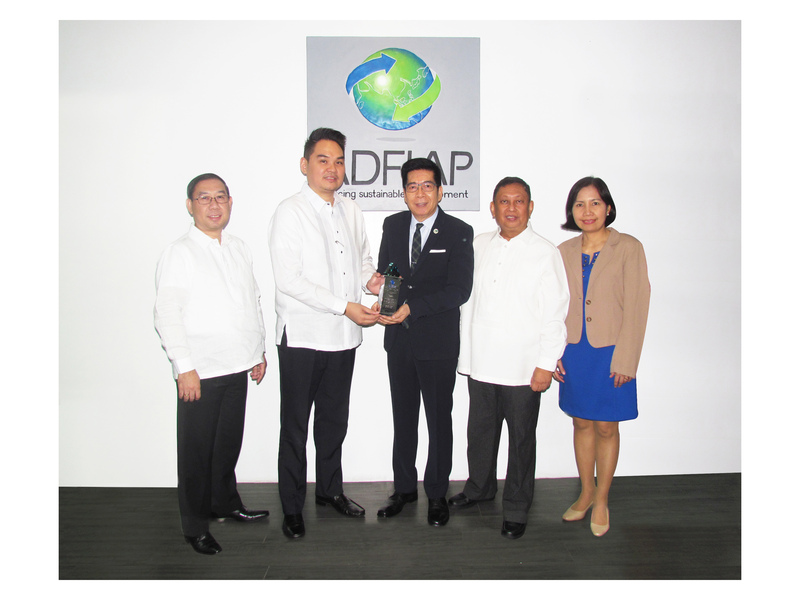 PhilEXIM receives its Association of Development Financing Institutions in Asia and the Pacific (ADFIAP) Development Awards for infrastructure development and corporate governance during the awarding ceremonies held at the ADFIAP office in Makati City on May 25. ADFIAP Secretary General Octavio B. Peralta (3rd from right) presents the award to FSVP Ian A. Briones, Head of Strategy and Development Sector. Also gracing the occasion are: PhilEXIM OIC-President and CEO Atty. Florencio P. Gabriel, Jr. (2nd from right); FSVP Emmanuel R. Torres (extreme left) and VP Rovi M. Peralta (extreme right) of the Business Revenue Group I. State-owned Philippine Export-Import Credit Agency (PhilEXIM) was recently awarded by the Association of Development Financing Institutions in Asia and the Pacific (ADFIAP) with two of its annual Development Awards for its contributions to development financing and strengthening corporate governance initiatives. In awarding ceremonies held in Makati City, ADFIAP Secretary General Octavio B. Peralta handed over to PhilEXIM officials the ADFIAP Merit Award on Infrastructure Development, for the development institution’s role in financing Steel Asia Manufacturing Corporation (SAMC), primarily its modern steel milling facility in Davao City. The Association also gave its Development Award for Corporate Governance category to the institution for its Strategic Framework initiative. PhilEXIM OIC-President and CEO Florencio P. Gabriel, Jr. and other officers of the Corporation, as well as representatives from SAMC were on hand to receive the award. “The twin recognition from ADFIAP is a continued demonstration of PhilEXIM’s mandate even in today’s business realities,” said FSVP Ian A. Briones, Head of Strategy and Development of the institution. Key initiatives of PhilEXIM, Briones explained, include institutional efforts to further strengthen the positioning of the Corporation as the preferred credit guarantee institution, in keeping with its role as the official export-import credit agency of the country. In the next few years, he said that the presence of PhilEXIM will be further bolstered to enable stronger support for infrastructure, agriculture, SME and export segments, aligned with the economic agenda of the government. For its part, Peralta reiterated the support of the Association for the programs of PhilEXIM and while it also thanked the Agency for keeping faith with its development mandate, it challenged the institution to further take on a more meaningful role in addressing financing gaps in the unbanked and underserved sectors. PhilEXIM is also the Trade and Investment Development Corporation of the Philippines, where its mandate includes promoting and encouraging domestic and international trade and investments During the Annual Asian Development Bank (ADB) Meeting held in Japan, Finance Secretary Carlos G. Dominguez III announced the plan to consolidate the guarantee functions of the government under one agency. PhilEXIM is the only sovereign guarantor and export credit agency serving as corporate vehicle for catalyzing private sector investments in the export and priority sectors. It is also an active member of the Asian EXIM Banks Forum (AEBF), a group of EXIMs/ECAs belonging to 10 Asia-Pacific nations with the ADB as permanent observer. "In line with the vision of Secretary Dominguez for PhilEXIM, the institution is preparing itself for the future role that it will undertake, and this will be important for us to lay down a stronger foundation in the terms of ensuring sustainability and relevance,” said Briones.